Tina Flocco started her journey as a nurse more than 20 years ago, after working on an oncology floor and developing a passion for the field. Both her parents’ lives had been taken by cancer, so she knew firsthand how important quality and compassionate care are to patients and families. From her first days as an oncology nurse, Tina went above and beyond to be an extraordinary healer. She enjoyed developing relationships with patients and families and providing both with education to manage their care. 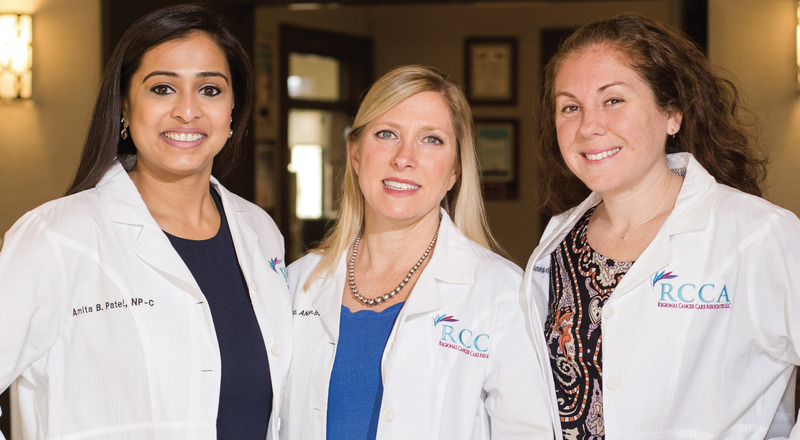 It led her to further her professional career by becoming an oncology nurse practitioner and joining a community oncology practice, Regional Cancer Care Associates, Central Jersey Division (RCCA CJD), where she has been working for the past 15 years. I met Tina more than seven years ago, when I was a new graduate nurse on the oncology floor. She would always take the extra step for the patients by ensuring that their discharge plans were completed or following up on test results and informing them and their families. She would also hold family meetings to discuss end-of-life care and provide support through these difficult times. She inspired me to be a better nurse and motivated me to become a nurse practitioner, as well. I pursued my professional certification and, upon graduation, turned to Tina for advice and guidance. With Tina’s kindness and mentorship, I joined RCCA CJD and began working with her. She spent three months patiently training me and making sure that I was equipped for the job. She took time to explain disease processes and taught me to perfect bone marrow biopsies. She truly is my mentor and role model — or, as I like to call her, Superwoman. Over the past four years, I have seen firsthand her kindness and ability to heal patients. I’ve also seen many examples of her going above and beyond baseline expectations as a nurse practitioner, making her an extraordinary healer. The first encounter was with a patient who had metastatic lung cancer, and when Tina called her regarding her lab results, she noticed that the patient, LC, was not responding appropriately and seemed disoriented. Because of her relationships with LC and those closest to her, Tina was able to immediately call LC’s friend and instruct her to check on the patient and bring her to the emergency room. LC ended up having brain metastasis and, because of Tina, received prompt management. Another instance occurred when a patient, AD, came for his chemotherapy infusion and, at the end of the office day, was still waiting outside for a ride. Before she left, Tina made sure that AD got a ride home after his long day. A third example involves a patient, ST, who for the past year was on a clinical trial that had prolonged his life beyond expectations, but was not following protocol: He was failing to bring his trial devices to his visits and risked being disqualified. Tina would not allow that to happen, so she fixed the patient’s device and sat with him until he finished all the required questionnaires. On her days off or while on vacation, she follows up on patients’ labs or radiology results and calls consulting doctors to ensure that the patients receive prompt care. When patients call for sick visits, they always ask for Tina, because they know and trust her. There are countless examples of Tina’s extraordinary healing abilities with the 50,000-plus patients she has touched over the years; these examples are from the past few months alone. Education has been one of Tina’s primary passions, and she continues to precept and teach new nurses and nurse practitioners. She helped create the chemotherapy teaching session provided by the nurse practitioners at RCCA CJD. This session is a vital part of a patient’s treatment plan, marking the primary visit during which the chemotherapy plan is reviewed and all potential side effects are discussed. Tina created a template through which easy instructions are given to the patients to help them handle their side effects. Due to Tina’s efforts, this teaching session is now a smooth process and has led to other endeavors, such as a process for survivorship visits. Aside from her clinical skills, Tina is a mentor not only to me but also to all nurses. As nursing manager, she actively listens to the nurses’ questions and concerns. She supports our ideas and provides positive feedback to us throughout our days. She has empowered me to become an independent nurse practitioner like herself. Although I do not have as many years of experience as she does, she counts me as an equal part of the team. I like to call us the Lady Avengers. I strive to be an extraordinary healer, just like Tina. Without her kindness and healing soul, many patients in our practice would struggle. She helps patients every day and through any situation and obstacle. She establishes the clinical guidelines that we should follow and helps us grow as practitioners. Tina is the foundation of our nursing practice, and I am proud to work alongside her. She fully succeeds in fulfilling the criteria of an extraordinary healer and deserves to be honored for her accomplishments.